A few weeks ago, I entered a contest for the Today Show. It was a Too Good To Be Healthy Chocolate contest. 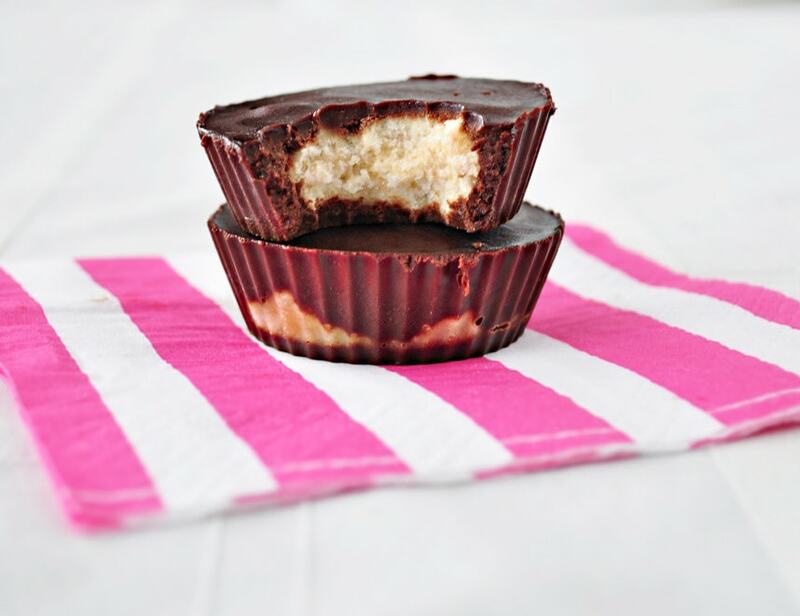 So I submitted my Chocolate Almond Banana Cups. Well, my chocolate almond banana cup recipe made the finals! So I flew to New York to be on the show. During the show, the hosts picked mine as their favorite. Can you believe it?? 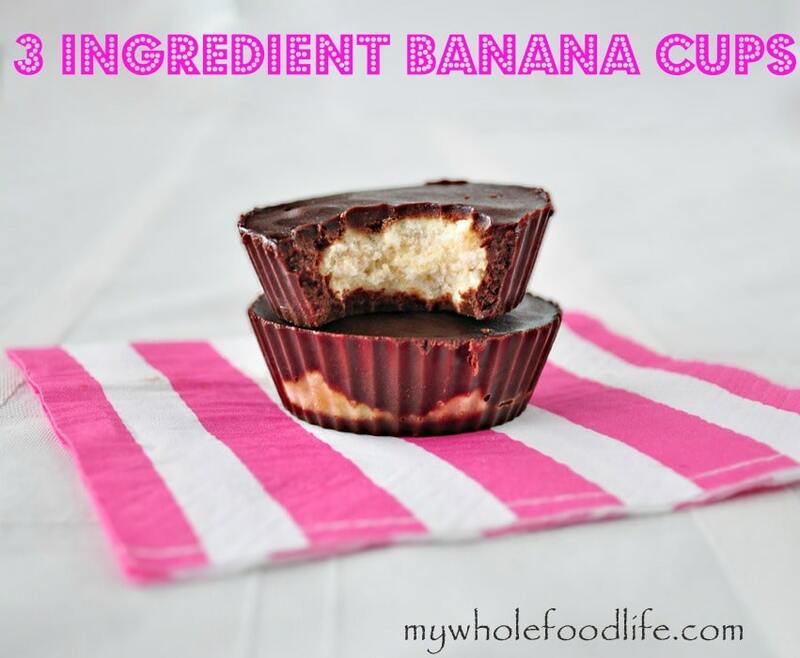 During this time, I tried a variation of the recipe which is how these 3 Ingredient Banana Cups were born. This came out so good that I had to share it with you. There is no added sugar and they taste amazing. I can’t tell you how much I love frozen bananas. They make the best ice cream too. If you haven’t tried my 5 Minute Banana Ice Cream, you need to. So good! A simple, guilt free treat! Using a double boiler method, melt the chocolate chips and milk. Once melted, pour a small amount into the bottom of some lined muffin cups . I used silicone liners and they worked great! Paper would also work. I was able to get six. Stick the muffin pan in the freezer for 5-10 minutes. While the chocolate is in the freezer, smash the banana. Add a bit of banana on top of each chocolate cup. Fill the cups with the remaining amount of chocolate. Stick the muffin pan back in the freezer until everything is firm. These chocolate cups need to be stored in the freezer. They get very soft as soon as you take them out. I also cut them into pieces and used them as an ice cream topping. Yum! Love your Recipes Melissa ! Would like to know if i can use unsweetened Cocoa Powder instead of chocolate chips and how much should be the quantity ? You might be able to make chocolate using this recipe. https://mywholefoodlife.com/2014/02/13/3-ingredient-chocolate-bars/ Not sure if cocoa powder can replace chocolate chips. I have a batch in the freezer. I added Earthfare peanut butter to the bananas & crushed walnuts on top. I was just thinking some peanut butter might be good, and read Michelle 's reply. Going to try both ways. Also has anyone else tried different fruit, strawberries and chocolate would be good like this. I guess I will just have to try. I think any fruit would work with this recipe. would regular milk work or change the flavor profile too much? Thanks! Did it air already? I love the today show. Yes. This was last February. Could a slice of banana be used instead of mashed? Can water be used instead of milk? You can just try omitting the milk. I don't think water will work. Made your chocolate bar recipe last night and I have banana cups in the freezer. Love the chocolate bar and can't wait to try the banana cups. Recently diagnosed diabetic, so I am thrilled to find your page. Looking forward to trying many more recipes. Thank you for sharing! You are so welcome Dana!